Theewaterskloof Dam lies just over the Franschhoek Pass. When it was established in 1978, it flooded a number of trees, whose bleached skeletons can still be seen poking out of the water. Some of them can be found on the sandy shores of the dam, depending on water levels, and make excellent photographic subjects. 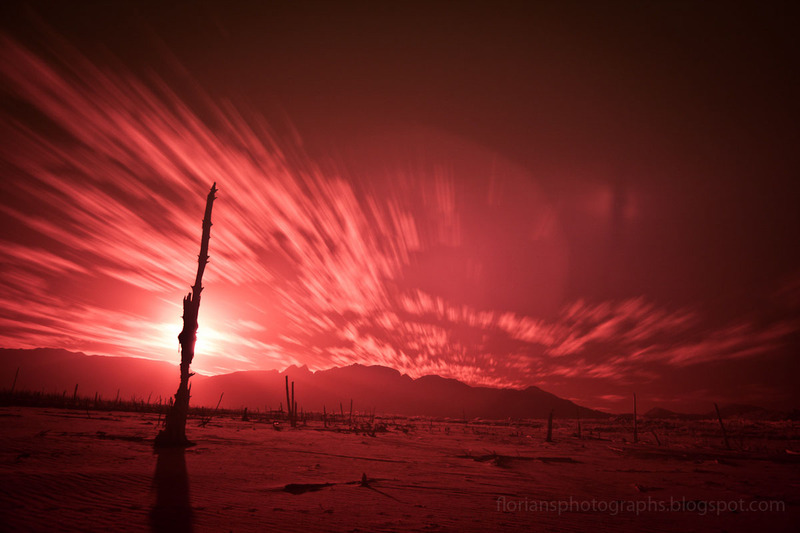 For example, The Eye of Sauron (mentioned in my previous post on infrared photography) was taken there back in 2011. I arrived there late one afternoon a few weeks ago, just in time to catch the last light on some of the trees. I blundered along the swampy shore (it had been raining heavily earlier that week) and tried to reach the trees I had photographed two years ago, but in the gathering dark I eventually gave up and turned back. Next time I'll bring gum boots! As the last of twilight faded away, the only remaining illumination was the light pollution from Franschhoek and Stellenbosch behind the mountains - and from the Milky Way, which was rising in the East. I set up my tripod and panoramic head and took a series of 30second exposures at ISO 3200 (the highest my old 40D can manage) and f/2.8, which I eventually stitched into the panorama above. I'll show you my post-processing below. It's quite similar to how I made the Quiver Trees by Night series.